Roasted Potato and Roasted Garlic Fendu, and the Holidays are Upon Us! Last week and this weekend were great days for bread. Well, I like to think so, anyway! I like to source my ingredients as locally as possible. Nevermind the discussions/arguments about the moral/social/economic benefits of using locally produced foods...I just think it's rewarding and fun to take the time to grow or find locally-grown foods for my cooking, bread and otherwise. 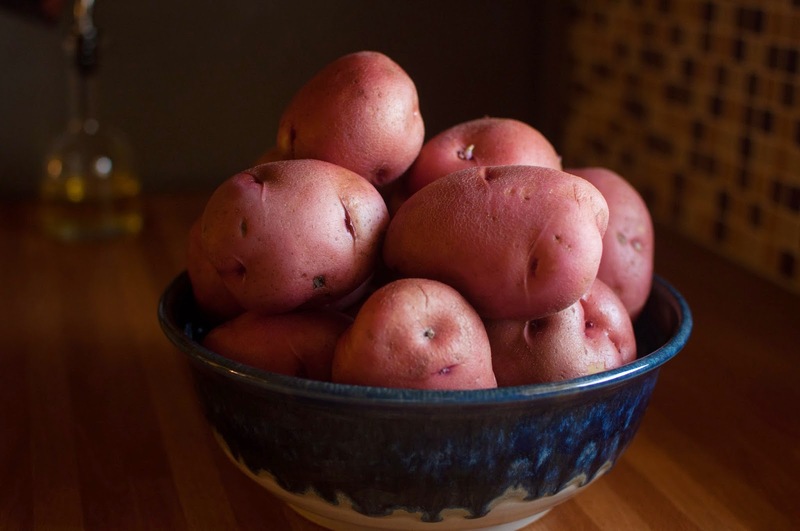 One ingredient I never figured to find locally-grown was wheat, but I was wrong! Abby and Jason at Three Sisters Farm in San Timoteo Canyon, just a few miles from here, grew some hard red wheat which we traded some bread for a sample of and milled. I replaced the usual portion of whole hard red winter wheat we usually use (from Utah) with Three Sisters Farm wheat and the results were delicious! I thought the flavor was noticeably different (and better) than our regular wheat's flavor. We'll be sprouting some of what's left to try that in some experimental loaves as well, and will report back on that test. Exciting stuff! Here's a video of the wheat being winnowed on some antique machinery. Top notch. We didn't have enough of Abby and Jason's wheat to bake it into this week's loaves, but this week's Roasted Potato and Roasted Garlic Fendu includes organic purple stripe garlic from Three Sisters, and is also made with Red La Soda potatoes from Jacinto Farms, just a couple of blocks from my house. Jacino grows here in Redlands, or at least nearby, as they claim that everything they sell comes from within four miles of town. Three Sisters Farm Garlic, ready for roasting. Baking and freshly-baked bread smell wonderful. You can imagine what the kitchen smells like every morning. It's fantastic. What could be better? Throw in some roasted garlic. 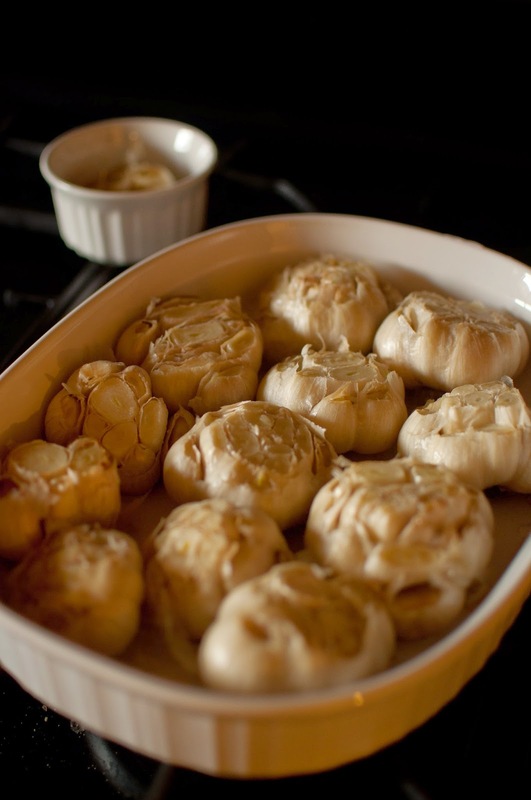 If you scratch your screen, you should be able to smell the roasted garlic in this photo. The roasted potatoes and the very small amount of olive oil left over from the roasting of the garlic and potatoes conspire to make for a very tender crumb and a soft crust in this week's loaf. 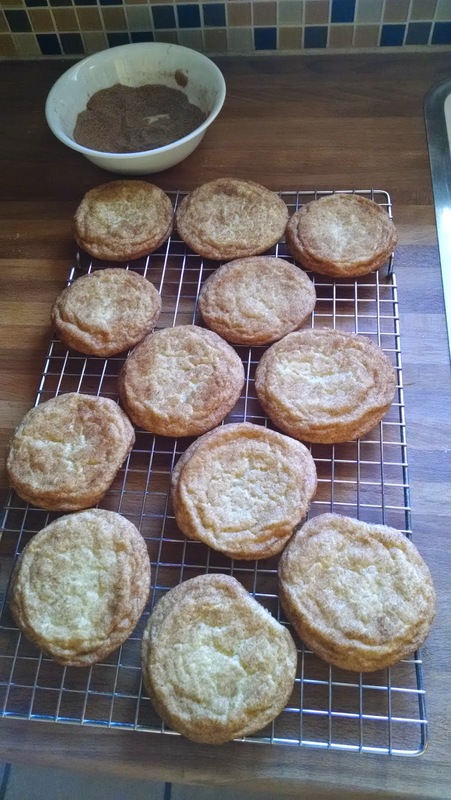 A bad cell phone photo of some tasty snickerdoodles. This week's breadshare also includes a little Lagniappe...snickerdoodles! My first adventure in baking was snickerdoodles, and at the Diersen house when I was a kid, I was the defacto snickerdoodle baker. I dare say, they were pretty good cookies. The recipe I used then had Crisco as the fat, and I do think there's something to be said for that, but this time I used a new recipe that uses all butter. Butter's a pretty safe bet. These came out pretty good, but I've had better. Our memory of how good a food was years ago is always skewed. There have even been studies to quantify this, I guess. 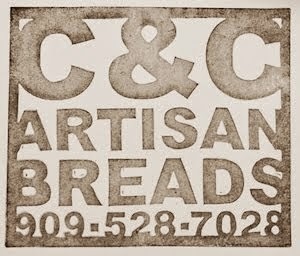 In the bagel section of his book "The Bread Baker's Apprentice," Peter Reinhart discusses the debate over what's the best bagel, and theorizes that "...nothing can top the taste of memory, but it is quite possible to find and make bagels every bit as good as in yesteryear, though never as good as those of our memories." I still think they're pretty good, and any snickerdoodles are better than NO snickerdoodles! Everyone in the bread share will be hearing from us shortly via email about the Thanksgiving holiday and our plans to ensure that everyone gets a loaf for their Thanksgiving table. It's going to be a busy weekend in the C&C kitchen. As a parting shot, I can't resist sharing this pan pizza with you. 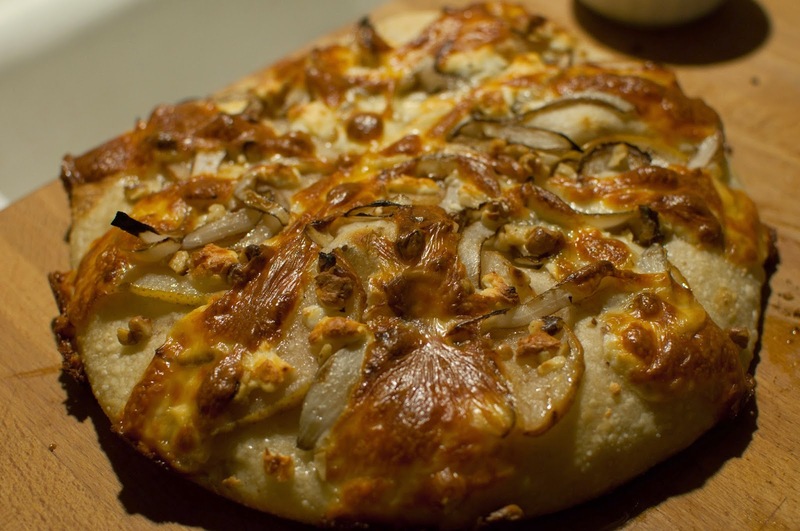 It's Cam's creation and includes gorgonzola, mozzarella, caramelized onions, pears, and I'm not sure what else. But it was delicious. We hope that this past week's rye was a big hit. We actually managed to sneak a loaf of it in the oven for ourselves, since we'd pretty much run out of bread! What a concept. A morning without toast is the start to a pretty sad day, indeed. This week we'll be introducing a new loaf! It's still a work in progress, but I figure it's ready for release into the wild for testing and evaluation. 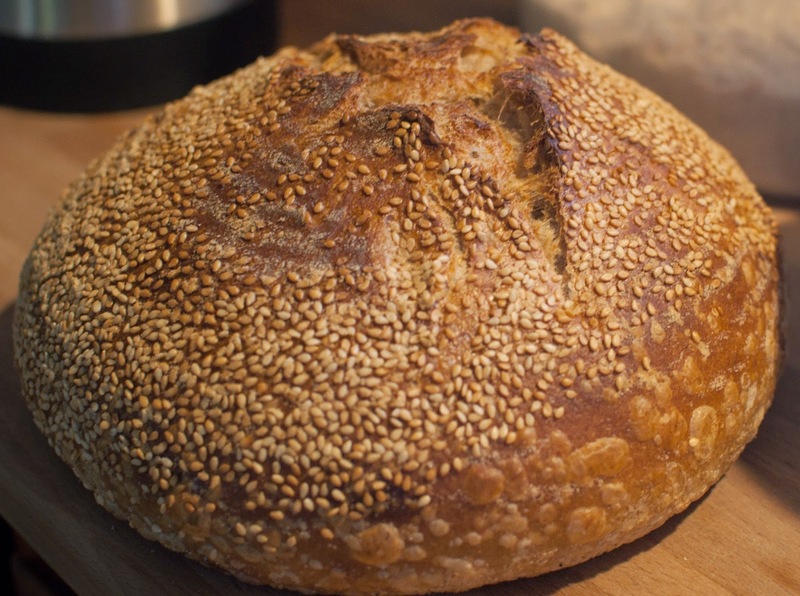 We're going to call this one the "Ancient Grain Seeded Sourdough." But it's a lot more than that. It's made with five different flours; unbleached all-purpose flour, high-protein bread flour, and three whole-grain flours that we mill ourselves; hard red winter wheat, organic dark rye, and emmer farro. 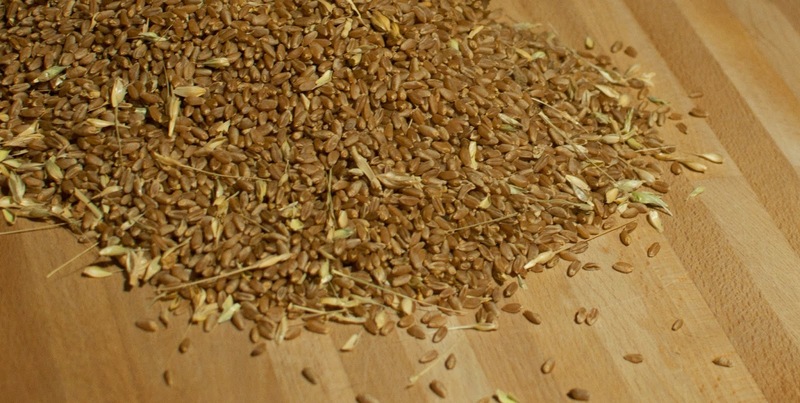 Emmer farro is the "ancient" part of the bread, as it's an heirloom wheat, which just means that it's not a grain that's been optimized for mega-farm production and mega-mill processing. This particular emmer farro is the last of the Bluebird Grain Farms stuff I picked up when we were in Twisp, Washington a couple of month ago. These grains are supposed to have all sorts of benefits depending on who you ask. I generally don't trouble myself with the details...I just want to see if it adds something to the bread that makes it worth adding to the mix. I'm sure that emmer, einkorn, spelt, etc. all have unique nutritional benefits. I'm also pretty sure that the "modern" grains, hybridized to be most productive and efficient for the world's white flour demands, are still pretty good for you, especially when milled with the entire grain berry. It's fun to try new things. This loaf was left to open on it's natural seams, per the method popularized of late by Ken Forkish. I think that I'll probably score most of the loaves this week instead of using this approach. It's more fun. Yesterday we paid a visit to Honeyville in Ranch Cucamonga. I can't tell you how fortunate we are to live near one of only four Honeyville stores in the world. They have a pretty interesting story, which you can read here. They carry a wacky range of stuff that fits into two themes; bulk flour and grains, and emergency preparedness. The two seem to go hand-in-hand. In any event, they are purveyors of truly high quality grain products. 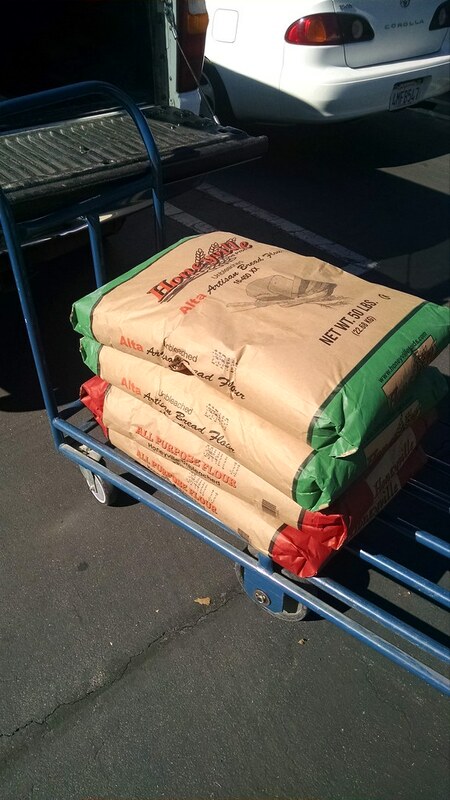 Here's 200 pounds of flour to add to what's left of last month's 250-pound order. 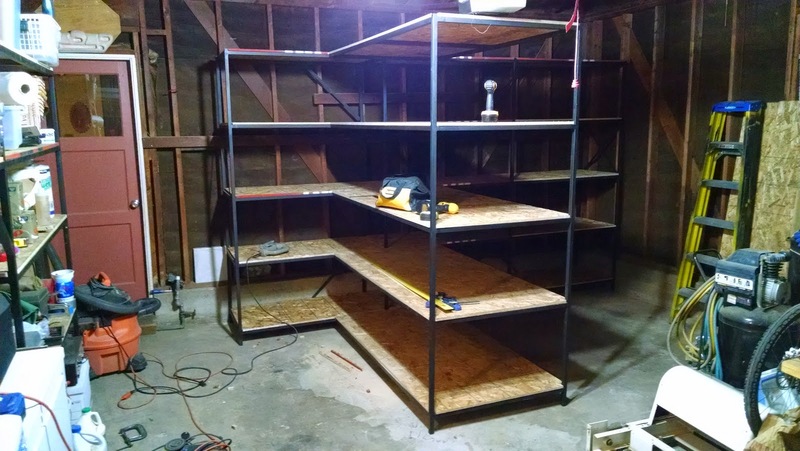 I've not had a lot of time to update the blog here this past week as we're in the midst of a massive space-optimizing exercise here at the C&C Ranch. The big project we've been working on lately is creating more space in the garage, which is alternately "somewhat clean" and "impossible to move in" depending on how long it's been since we last organized it. 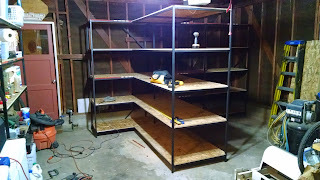 Well, we just finished the second set of shelves, and these are the "big ones" which will up the total shelf space in the garage to soemwhere near 250 square feet. It's hard to get a good photo of these shelves, but here's an attempt. You can actually see the disassembled Berkel Bread Slicer in the foreground. Found a lot of hidden issues with this machine when it was finally fully disassembled, including some truly dangerous electrical jury-riggings. Sigh. At some point, I anticipate that the bread slicer will live right at the front of the base of the "T" section of these shelves. It's going to be a hot one today, so we're going to try to get these shelves populated before the mercury gets up to 90 today. Gads! Isn't it November? Oh, and I had to share this photo of a happy customer and a snapshot of some bread-related deliciousness. 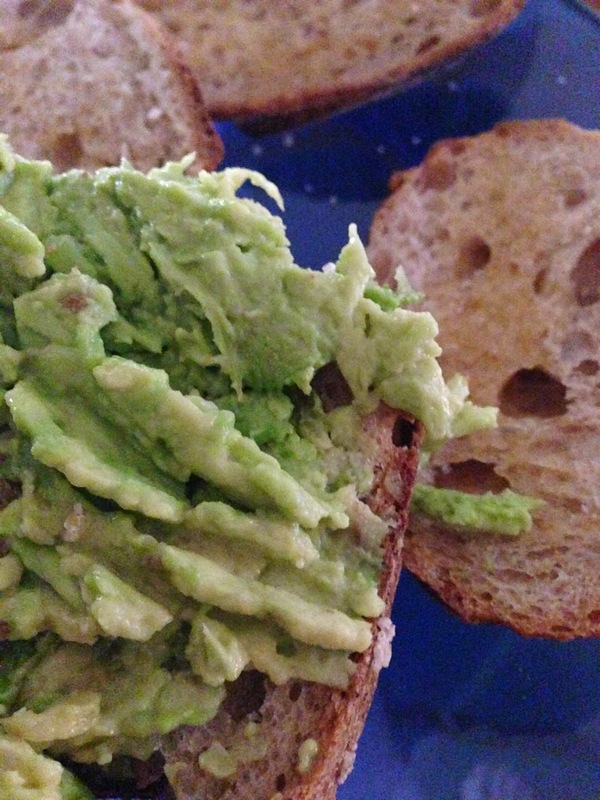 It's gratifying to get cell-phone snapshots of what people are doing with our breads. It's also gratifying to see people capturing people's excitement about the bread. I know I've said it early-on in this blog, but I never tire of people's excitement about the bread. Your opinions about the quality of our product really matters to us. Criticisms are welcome. They might not change the end product, but they're definitely given due consideration. Accolades are also welcome, of course. Your stories about how you, your family, and your friends enjoy our breads are the highlight of my day. Really. I never tire of it. 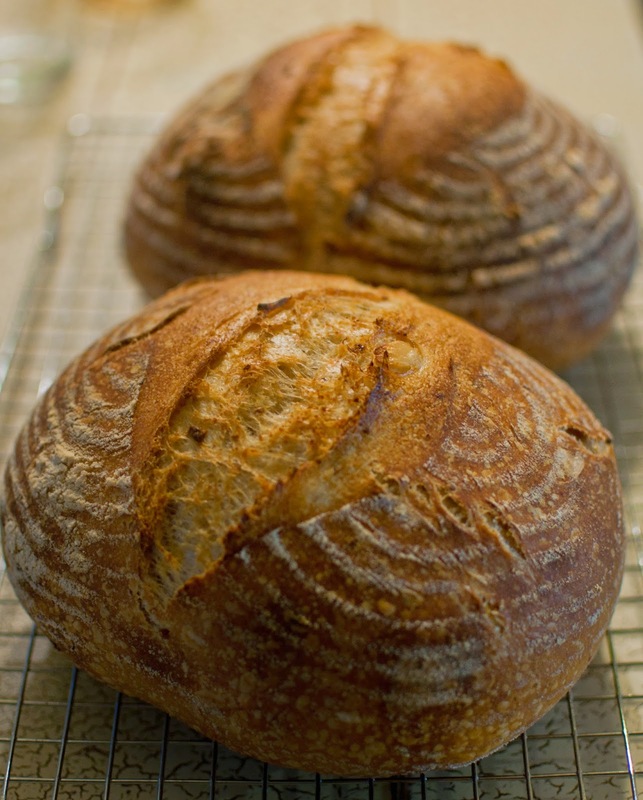 Bread is such a simple, fundamental pleasure to make, eat, and share. Sharing and facilitating that experience with all of you is very rewarding. A (perhaps somewhat too) happy customer with her Country Loaf. Ha!